A popular commercial apple variety in New Zealand. It's been a very long time since I have eaten this apple but have always remembered its size, texture, juiciness and weight. As a previous reviewer commented - 'they won't keep well' - totally agree, they didn't have time to deteriorate. It is interesting to note that this apple is (?only) available in the South Island. In the 1960's we used to buy this apple in 20kg bags from a place called Karapiro, south of Hamilton. If I could purchase this tree for my Parents' homestead and for our moko's (grandchildren), then they would appreciate a truly DELICIOUS apple. 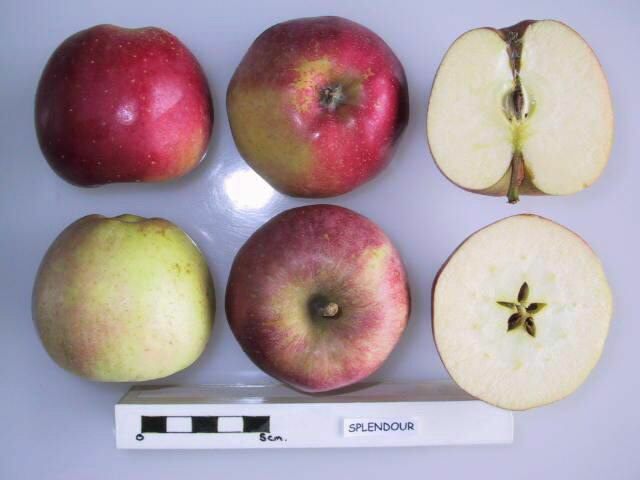 My mum had a Splendour Apple tree, along with 3 other varieties but Splendour was by far the best apple I ever ate! I never saw it in the shops but always remember it's incredibly crisp, juicy, white flesh, bright pink skin and sweet 'honeyied' flesh often around the core. I'd love to be able to try one again. Further info. Introduced 1964 Discovered originally in a garden at Napier, New Zealand by Charles Roberts in 1948.